On 16th December 2012, the Community Alliance SA’s celebration of the 175th anniversary of Colonel William Light’s Plan for the City of Adelaide was attended by members of the executive committee, including the President Mr Tom Matthews and Dr Helen Wilmore. Following on from this celebration, Mr Matthews visited the town of Gawler on 21st December. Gawler was the first country town in the state of SA and its town plan was also devised by the surveyor Colonel William Light. Mr Matthews met with Dr Wilmore and Mrs Shirley Humphrey, both of the Gawler Region Community Forum, and was taken on a tour of the town and areas earmarked for future urban growth. 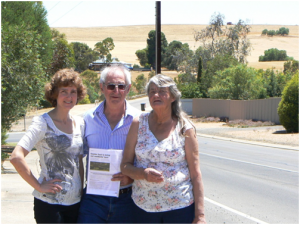 Tom Matthews, centre, (President of the Community Alliance SA) with Helen Wilmore, left, and Shirley Humphrey, right, of the Gawler Region Community Forum, on Cheek Avenue in Gawler East, with Concordia land in the background earmarked for future residential development. 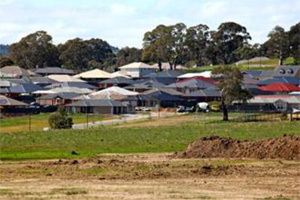 Since 2007, the Gawler Region Community Forum has expressed its concerns with the State Government’s proposed large-scale urban expansion of the town and surrounding areas. The concerns include issues such as traffic, provision of infrastructure such as schools and hospitals, lifestyle, environment, and food and water security. The State Government’s planned expansion of Gawler and surrounding areas will see the population increase threefold. “The nearby expansion of Roseworthy for 95,000 people will also bring extra pressures for the rail and road systems” said Mrs Humphrey. “Where are all these people going to work?” asked Mr Matthews. “What about the agricultural land that will be lost from Concordia and Roseworthy? That’s our food bowl” said Mr Matthews. “The State Government is not listening to the people of Gawler when it comes to planning and development” said Dr Wilmore. “A lot of problems could be avoided if only the Government would properly consult with local communities and involve them from the initial planning stages”. Convenor & Spokesperson, Gawler Region Community Forum Inc.
Committee Member & Spokesperson, Gawler Region Community Forum Inc.
Time for ACTION – Lobby a polly NOW! Stop this farce of community consultation after big development decisions are made. Historically, interim operation powers were used to provide a protective measure to stop inappropriate development, such as the demolition of heritage buildings, while public consultation on a new Development Plan regime takes place. However, recently these powers have been used to push through development even before public consultation has occurred. This is what happened with the interim DPAs for the Capital City, Regulated Trees and Statewide Windfarms. Although the Community Alliance SA is not aligned with any political party, Mark Parnell MLC of the Greens, has plans that address some of the concerns the Alliance has with the current planning system, beginning with the interim operation powers. Mark has used information from the Alliance to identify our planning and development issues and the key areas needed for reform. He has already introduced the Interim Development Control amendment bill, to change the appropriate section of the Development Act. There will soon be a vote on this bill in the Legislative Council (Upper House). This proposed new legislation is very important to the Alliance as it is something WE have asked for. It’s time to support Mark’s Bill by lobbying local MPs in the Lower House and the members of the SA Legislative Council (Upper House). Keep checking our website and facebook for updates and information on when the vote in the Upper House will happen. It will be great to fill the public gallery! The vote in the Lower House will be at a later date, but please start lobbying local MPs as soon as you can. To help Alliance member groups and other concerned members of the community, we have prepared a Lobbying Kit. The kit includes information about this Bill and possible future Bills, why we want an end to the current Interim Ministerial DPA legislation, and how to lobby politicians for their support. In the Lobbying Kit, you will find everything you and your Group needs to successfully lobby politicians. Greens MC, Mark Parnell has drafted a bill to amend the Development Act to stop unscrupulous developers taking advantages of the interim operation provisions of the Act to get proposals approved without any effective public consultation. His second reading bill, reproduced below, proposes a simple amendment to require the Minister to consider the possible negative impact of any interim proposals. Pretty obvious really, and surely not too contentious, but you can bet your northern light, the development industry lobbyists will push the major parties to throw it out. That just leaves us citizens to get on to our state MPs and demand they support Parnell’s amendment. As the ecerpt from His newsletter below states (in blue), the time has come to deck the halls with emails and phone calls to MPs. As reported on the Community Alliance website, I have introduced a Bill into State Parliament to prevent the mis-use of “Interim Operation”. This is a “shoot first, ask questions later” mechanism that allows the Planning Minister to rezone land or change the planning rules BEFORE undertaking community consultation. The worst recent example was the “Capital City DPA” which saw massive tower blocks being approved 2 weeks BEFORE the public consultation meeting was to be held. That is just insulting to all those who bothered to have their say in good faith, thinking that the Government might listen. I hope to bring my Bill to a vote when Parliament resumes in February. In the meantime, it will be crucial for as many people as possible to lobby MPs to support the Bill. I already have the support of key planning and legal groups, but it is critical to get both the major parties on side before bringing the Bill to a vote. Tell the Minister for Planning , John Rau MP, Members of the Legislative Council, and your local MP that you want this abuse of planning laws to stop. Please send me a copy of any emails you send, and I’m keen to hear any responses you get too. The Hon. M. PARNELL: This Bill is to prevent the Government from undermining community rights of participation in relation to planning. In particular, it prevents the Government from abusing a provision of the Development Act that allows the Government to bring planning changes into effect immediately, and thereby circumvent the statutory public consultation regime. The provision I refer to is section 28 of the Development Act—Interim development control (or ‘interim operation’). This provision allows the minister to bring a development plan amendment (DPA) into operation on an interim basis at the same time that it goes out for public consultation. I want to give three recent examples of how ministerial DPAs brought in under interim operation have affected community rights and undermined confidence in the planning system. The first of these is the Regulated Trees DPA. Members would be well aware that the issue of large trees and how they should be protected has been debated in this place. We have had a bill, it has been the subject of regulation, but it is also the subject of a DPA. This was brought in under interim operation on 21 November last year. If the purpose of that DPA was to make it harder to chop down trees, to try and preserve some trees until the final planning arrangements had been put in place, that would have been an appropriate use of interim operation. Instead, the purpose of the amendment was to make it easier to remove trees; therefore, despite the fact that public consultation was ongoing, we were seeing the impacts of that change already in the community. The second example is that of the Statewide Wind Farm DPA. This DPA was brought in under interim operation, and it made it easier to build wind farms by removing public notification and appeal rights in the majority of cases. That particular DPA was one that the Greens were very critical of; not critical of the renewable energy, not critical of wind farms—we believe there is great capacity for more wind farms—but we objected to the interim operation and the removal of public notification and appeal rights. It is in operation on a temporary (interim) basis while feedback is sought from the community. During this time, all the proposed policies are in effect. However, changes can be made to the amendment in response to the public feedback. That sounds quite reasonable when you look at it. It says, ‘Well, yes, it has come into operation temporarily, but changes can be made; therefore, there is no problem,’ but there is a major problem, and I will proceed to explain what that is. When DPAs are brought in under interim operation, development applications can be lodged and will be assessed against the DPA even if it is subsequently abandoned, withdrawn or changed. If the DPA does not go ahead, that decision later has no effect on any development applications that were already lodged because, under the Development Act, applications are judged against the development plan that exists at the date of the application. In other words, any subsequent withdrawal or amendment of a DPA is not retrospective. So what usually happens is that, whilst public comment is underway, applicants are able to lodge their development applications, knowing that they are likely to be approved even if the changes introduced to the zoning, for example, on an interim basis are subsequently not proceeded with. Once your application is lodged, the planning rules are locked in. In the case of the Capital City DPA, most of the controversy is centred around the approval of a multistorey residential development in Sturt Street known as the Mayfield development. The development consists of three towers, the highest being 14 storeys, or 95 metres high. The ground floor will be offices and shops and the higher floors residential. There will also be basement car parking. This development application was lodged in April this year, very shortly after the interim operation of the DPA came into effect on 28 March. The development application was considered by the Adelaide City Council’s Development Assessment Panel on 4 June, and it was approved 10 days later by the Development Assessment Commission on 14 June. There was no public notification of the development and no ability for neighbours or the broader community to have their say. In relation to the DPA that facilitated and allowed for the rapid approval of this development, the public consultation phase comprised two stages: the first was the lodgement of written submissions and the second was the public hearing conducted by DPAC (Development Policy Advisory Committee). The hearing was held on 27 June, some two weeks after the Mayfield development had already been approved. What this means is that the 52 members of the public (primarily local businesses and local residents) and all those people who had something to say about the planning changes who relied on their statutory right to make comment found that key decisions had already been made before they even had the chance to front up to the Development Policy Advisory Committee and to have their say. That means that irreversible decisions had been made before they had had a chance to have their say and, therefore, the consultation has, quite reasonably, been described by local businesses and residents as an absolute sham. In fact, I would say it is worse than a sham: I would say it is an insult. It is an absolute insult to people to pretend that you are inviting them to have their say and asking them for their opinions when irreversible decisions have already been made so that their submissions amount to absolutely nought. I think it is an outrageous situation, and I think it is part of the reason why the rally that was held a number of weeks ago to complain about this DPA was so well attended and why people were so angry at the process that had been followed. However, one common tactic of government when people criticise the process is to shoot the messenger and assert that the real issue is the merits of the change and that, if you are against the process, you are really just hiding your opposition to the substance of the change. I reject that accusation. It is just not true. As I have said, the Greens are strong supporters of wind energy, but we have publicly opposed the axing of public notification and appeal rights and bringing those about by interim operation. The broad intent of the DPA is supported, that being to increase the population and development potential of the city in order to help make the city the thriving heart of Adelaide, the state’s capital. I agree entirely. I absolutely agree that we need to revitalise the city, and that is going to mean more people living in the city and more development. So whilst I, too, can support the thrust of the DPA, there will be a great deal of detail that I would have concerns with, and I am absolutely opposed to the process of bringing in such important changes under interim operation. I note the submission from the two councillors went for 22 pages, with a large number of well-considered recommendations for change, many of which would be made completely redundant by the fact that the biggest development so far proposed has already been approved. So, for these representers, for any of the 52 who had fantastic ideas and had improvements to propose, it is too late, and it does not mean a jot in relation to those applications for development that have already been lodged. Putting a permissive policy like the Capital City DPA into interim effect, and then purporting to hold the consultation process afterwards is an abuse of process. We do not consider this to be a reasonable measure or ‘necessary in the interests of the orderly and proper development of the area affected’. What happens to development applications approved under this policy if there are revisions as a result of consultation? Will development approvals then be disallowed or scaled back? Irrespective of the rights and wrongs of the policy content—this process is wrong! Our aim is to put the people back into planning. Interim operation of DAPs usually protects an area or object, but in this case,(and in the significant tree DAP)[the one I have already referred to] the opposite has occurred. This is most concerning for the 26 member groups of this organisation and is something we wish to see changed in the future. That is why I have introduced this bill. The Community Alliance is spot on. If the minister cannot be trusted to use powers properly, then the parliament needs to step in with guidance. The government attitude in these matters is that the ends justify the means, and in some ways it reminds us of the book—I think it was written by Graham Richardson, the former Labor powerbroker—Whatever it Takes. So, the government is focused on the outcomes and it is ignoring the process. I will finish shortly, but I do want to conclude with a bit of a history lesson. It is a history lesson that I have tried to deliver to members of the Development Policy Advisory Committee, to members of the minister’s own department and to anyone else who will listen. It has so far fallen on deaf ears, so I think that it is time for the Legislative Council to pay attention. There has been a growing tendency for councils to request the Governor’s use of section 43 of the Planning Act to bring supplementary development plans [that is what we now call DPAs] into operation on an interim basis at the same time as they are approved for public exhibition. This is an important section of the act, of particular effect where there is a risk that, when the supplementary development plan becomes known during its public exhibition phase, applications may be lodged under existing rules which may prejudice the achievement of the objects of the supplementary development plan. I advise that as a general rule, I will not favour requests for the use of section 43 unless it can be demonstrated that there is a risk that development may occur which is hostile to the intent of an SDP. Such requests should be made when the supplementary development plan is submitted for approval of public exhibition. I will ask the Advisory Committee on Planning to report its opinions to me on this matter at the same time that it reports on the plan under section 41(5). I generally will not recommend such requests to the Governor, however, where the interim operation of the supplementary development plan is intended only to speed up the approval of a particular development. To approve the interim operation in these instances would, of course, effectively negate the extensive opportunities for public comment provided in section 41 of the act. It is signed ‘Don Hopgood.’ What the minister is saying in that circular is that there are valid uses of the interim operation provision. For example, it would make no sense for a council or for the minister to flag its or his or her intention to heritage list properties, then go out to public consultation and find that several months down the track all those properties have since been demolished. That would make no sense. The amendment is in operation on an interim (temporary) basis for 12 months from 19 October 2011. This means the policy changes in the amendment are in effect while the Minister for Planning consults with the community and considers the amendment. Interim operation ensures that inappropriate development does not occur during the period of consultation and consideration. That is exactly what Don Hopgood said the use of interim operation was, and it is the exact opposite to what the government did in the wind farm DPA. It effectively used that method to fast-track development rather than its more appropriate use—in fact, I would say its only appropriate use—which is to stop inappropriate development. This is what my bill seeks to achieve: it seeks to put in practice the principle that interim operation is not a fast-tracking tool to be used by the minister without regard to proper planning principles. Interim operation should be limited to stopping inappropriate or undesirable development applications that would undermine the proposed changes. It is not to undermine public consultation and fast-track development that is consistent with the proposed changes. …in order to counter applications for undesirable development ahead of the outcome of the consideration of the amendment under this subdivision. An undesirable development is defined as development that would detract from or negate an object of the amendment. So, really, it is back to the future. What this simple amendment seeks to do is to go back to what Don Hopgood realised was the proper use of interim operation. It goes back to what the public servant who wrote that particular part of the web page on the wind farm provisions believed was the proper use of it, even though it was an inappropriate use on that occasion, and it makes sure that public consultation is only curtailed in the most necessary circumstances. I think that this bill will receive a lot of support in the community. I think local councils are very likely to support it, because they have been the victims of a lot of these ministerial development plan amendments brought in under interim operation. With those words, I commend the bill to the house. Despite the State Government’s assurances, and recent sweeping changes to the planning and development regime, the underlying legal and administrative process shaping the present development assessment system remains unchanged. It is, in many respects, secretive, lacking in transparency and accountability, legalistic and adversarial. It involves processes that effectively shut out the voices of the communities most affected. A couple of standout examples are the large, poorly designed “urban regeneration” project at Port Adelaide, which nearly lost the Labor government its safest seat; a “land swap” deal in Woodville where a century-old park and local landmark was turned over, virtually overnight, for a new housing estate, again without any appropriate consultation process; and a large tract of prime agricultural land at Mt Barker being “re-zoned” to make way for a substantial housing estate, again without credible consultation or explanation. I could fill up this whole article with similar woeful stories, many of which will continue to affect the local communities. The pattern these stories reveal is a consistent one of poor process; seemingly affected by politics; secretive, sometimes unaccountable decision-making; potential conflicts of interest; and a record of less than meaningful consultation, where the people most affected are called on afterwards to largely “rubber-stamp” what has been decided. When they oppose these disasters, they are labelled “anti-development” – a term that obscures the real and often justifiable reasons for their anger and frustration with the current system. One problem is that all power in the current system resides with the State Government, the one branch of government none of us has consciously chosen to manage our development needs. Simply giving the Government power to make these often complex decisions, at its discretion, is bad policy and bad law. Under this regime, if a council’s expert planning and development committee rejects a proposal on reasonable grounds, the developer can appeal to the Environmental Resources Development Court, the Planning Minister, or to an alternative but overriding state government panel of experts (the Development Assessment Commission). Unlike the council, these bodies can make their decisions without engaging the community most affected. The resulting lack of transparency and accountability, and the difficulty of making any genuine objections heard, has left those involved feeling they are caught in a closed, legalistic and adversarial process. Secondly, the current system works in a way which is designed for the consultants and lawyers, rather than the broader community it is supposed to serve. It provides no early opportunity to engage the community on the proposed development; instead, preliminary consultation, restricted by some extremely narrow categories, occurs well after the developer has committed large sums on consultants and “locked in” a design, however overblown this might be. This means many people hear about a large new development in their neighbourhood through the local press. It also means that any “negotiation” that occurs over the design happens in a legalistic setting behind closed doors, with much of the technical information on the decisions made kept secret from the community for pseudo-legal reasons. Bad decisions, once made, can be appealed only in a setting that guarantees a high cost, a scary courtroom appearance, and an almost inevitable failure for the little guy. This generates a lot of anger and frustration, and a deep cynicism about the process itself. Thirdly, the “consultation” processes now used are seen as mostly window-dressing for decisions already made. So in Port Adelaide, Woodville, Cheltenham and Mt Barker, the public view is that “consultation” occurred after the decision to go ahead had been made “in camera”. In none of these cases was the reason for the decision adequately explained, naturally giving rise to suspicions of political factors coming into play. Even state parliament, it seems, cannot extract the full reasons for these decisions from the Minister. Instead, those who make the effort to attend consultation meetings are left feeling they have been given “spin” about each development’s future benefits. It is not surprising most residents treated in this way will not trust the process. The idea that such a process – lacking the desired levels of transparency, accountability or community engagement – can somehow deliver “sustainability” for South Australia is laughable. To regain public trust in development, we need more than glossy brochures and spin. While the idea of bringing in a panel of expert designers to look over an initial plan might be very sensible, even good design cannot be sold without due process – that is, without proper transparency, accountability and community engagement. Dr Robert Crocker is an executive member of Community Alliance SA, a new umbrella group of residents’ associations dedicated to changing the development and planning regime in South Australia. He is also a senior lecturer in the School of Art, Architecture and Design at the UniSA.